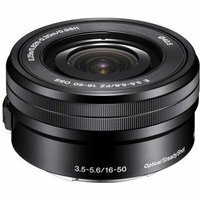 The Sony E16-50mm f3.5-5.6 OSS lens is a retractable zoom perfect for travelling and other scenarios that require a lightweight, compact camera and lens combo. When fully retracted the lens is just 29.9mm, yet covers a wide 16mm to 50mm range (35mm equivalent 24-75mm) for flexible shooting. The lens features one ED (Extra-low Dispersion) and four aspherical elements, resulting in a high-performance lens that is surprisingly portable. The Power Zoom with manual override is the first E-mount lens with an electrically driven zoom mechanism.